Introduced to readers in the novels The Atrocity Archive and The Jennifer Morgue, the Laundry is a secret British government agency charged with preventing dark interdimensional entities from destroying the human race. Now, in “Overtime,” the Laundry is on a skeleton staff for Christmas — leaving one bureaucrat to be all that stands between the world and annihilation by the Thing That Comes Down Chimneys. Written especially for Tor.com’s holiday season, Charles Stross’s novelette is a finalist for the 2010 Hugo Award. Charles Stross is the Hugo-winning author of some of the most acclaimed novels and stories of the last ten years, including Singularity Sky, Accelerando, Halting State, the “Merchant Princes” series beginning with The Family Trade, and the story collections Toast and Wireless. 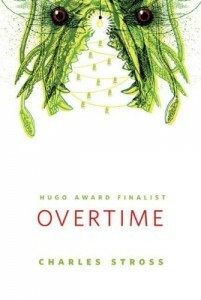 I think Overtime is the only Christmas-themed book I have in my Kindle, and I really scheduled to read it in December. I have never heard of Charles Stross before, but who am I to deny myself of a free ebook, right? In Overtime, Bob Howard ends up being the night shift guard on duty on Christmas — he didn’t want to, but he wasn’t able to file his holiday leave so he was left with no choice. Bob was prepared for an uneventful night alone in his temporary office, but memories of the Laundry Christmas party and some strange noises and temperature drops tell him that something else is coming — through the chimney. I have never read any books from the Laundry Series, so the characters and the settings in Overtime were all new to me. I was kind of wary about that and I thought I would get lost in the story, but I was surprised that I wasn’t. While I would want a better explanation of who the other characters were and what Laundry was really all about, I felt that this novella was still complete enough to stand on its own. It’s very reminiscent to Jasper Fforde’s work, with the same British humor (although I think Stross is Scottish) with urban fantasy tones. And I liked the Christmas twist on the story, too. I’m not sure if I want to splurge on the other Laundry series books, but I am definitely curious. I think I would need a little more convincing…but not so much. Any words to convince me to do so?